Abell 31 is a very faint nebula caused by a dying star as it releases dust and gas. This massive planetary nebula is about 2,000 light years away from Earth in the constellation of Cancer. 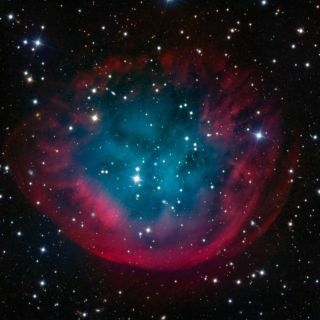 Appearing to burst from space in glowing red and blue, this stunning photo captures large planetary nebula Abell 31. Skywatcher Adam Block took this photo from the Mount Lemmon SkyCenter at the University of Arizona. According to the Mount Lemmon SkyCenter website, it took 21 hours of exposure to create this image during a observing sessions in December and January. Block used a 32-inch Schulman telescope equipped with an SBIG STX16803 CCD camera and an Astrodon Gen II filter to photograph the nebula. Multiple exposures are made to collect enough light for an image that would otherwise not be evident to the eye. Light from the central star in Abell 31 has spread out more than 10 light-years wide, causing it to be faint in the sky. Abell 31 is a planetary nebula caused by a dying star as it releases dust and gas. As the star dies, it starts to expel wind quickly; the process then slows and speeds up again. The faster wind runs into the slower winds and forms colorful shapes in the sky. In this image, red gas signifies hydrogen and blue means oxygen. Abell 31 is about 2,000 light-years away from Earth in the constellation of Cancer. A light-year is the distance light travels in one year, or about 6 trillion miles (10 trillion kilometers).